The bayou and surrounding delta wetlands are iconic characteristics of New Orleans and its history. In New Orleans southern districts lie the Jean Lafitte National Historic Park and Preserve, the Timken Wildlife Management Area which sit around Lake Cataouatche and Lake Pontchartrain. An important home to many forms of wildlife, the bayou acts as a protective barrier for cities like New Orleans from the extreme storm surges like hurricanes and floods. However, coastal erosion has significantly affected the bayous, leaving New Orleans at a higher risk of damage as occurred with Hurricane Katrina in 2005. In fact, the Mississippi Delta is disappearing by 110 meters per hour or 16 square miles a year because of natural and manmade forces like climate change. As a result, many preservation regues, organizations, and projects have been established in and around NOLA to curb the damage through educational and conservation initiatives. Hopefully these efforts will sustain and rebuild the wetlands for generations to come. One way New Orleans aims to protect its natural bayous has been to create preservation areas that can help educate locals on the importance of the surrounding ecosystem. The Jean Lafitte National Historical Park and Preserve, located in the southern part of New Orleans offers a direct way to help combat the shrinking wetlands. The park seeks to preserve and demonstrate the influence of the natural environment and unique cultural history of the region. Six separate sites and park headquarters feature a mix of educational programs for school groups and a visitor center which feature films on Delta culture and environment. 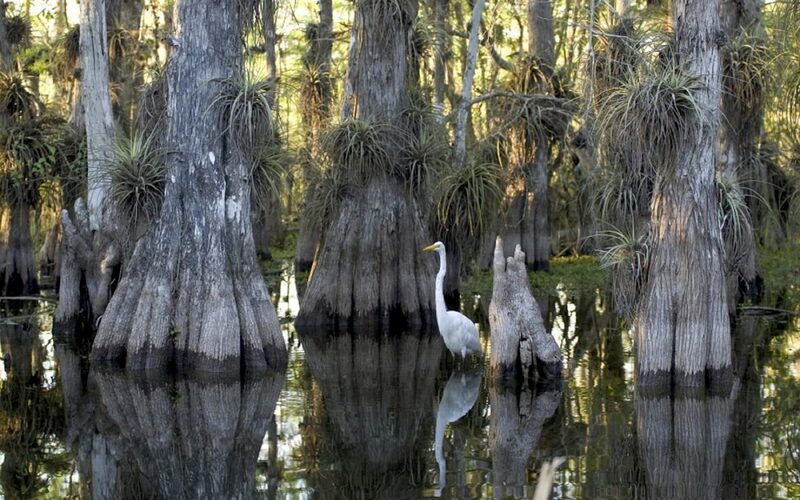 The Barataria Preserve is located in New Orleans and features over 23,000 acres of bayous, swamps, marshes, and forests. Visitors can find alligators, nutrias, and over 200 species of birds within the preserve. One of the main purposes of the park is to provide research into preservation practices, natural resources, and wildlife. The engaging center allows guests to search for and report their sightings of animals, plants, and more to provide them with more knowledge about the surrounding ecosystem. Locals can also volunteer at the park! Be sure to support the park’s efforts! The Gulf Intracoastal Waterway Shoreline Stabilization and Restoration Project is attempting to provide habitat and protection to southern Louisiana wetlands. Phase one of the project is now complete and stabilizes embankments lost by storm surge. Now, one mile of Vegetated EcoShield has been installed to protect from further storm surge which not only help nearby towns, but also help preserve further wetlands and cities north of the coastline, including New Orleans. The EcoShield is created from recycled post-consumer plastics to protect the shoreline and banks. When the project completes, the effort will also help to protect energy assets, protect seafood, and the recreational waterways. To support this effort you can donate time and money. Volunteer efforts are encouraged and you can stay updated on efforts by joining the email list! The Coastal Protection and Restoration Authority has issued a $50 billion project to help preserve marshland loss. The base Coastal Wetlands Planning, Protection and Restoration Act (CWPPRA) project addresses marsh loss on the south and east sides of Lake Hermitage. By the year 2050, 28% of the 1990 mapped marsh land is project to be lost. The project aims to restore the eastern shoreline and prevent further erosion and prevent breaching of the inner marshlands. The next goal is to recreate 549 acres of lost marshland in the southern region. The project will restore 6,106 linear feet of eastern shoreline and 5 more acres of habitat with earthen terraces. Another aspect of the project aims to create brackish marsh. Reconstruction will provide ecological benefits to help regrow injuries and losses from the Deepwater Horizon oil spill. The marshland will be created in the Barataria Hydrologic Basin which was heavily affected by the oil spill. The non-profit sanctuary preserves wildlife and offers environmental and humanitarian education and action for the Southeastern Louisiana region. Their wildlife rehabilitation center monitors hundreds of animals that live in their sanctuary as they readjust to the wild. In their 27 years of operation, they have cared for over 30,000 sick and injured animals. They have also helped to sustain wildlife during disasters like Hurricane Katrina and the BP oil spill. Helping to preserve, protect, and educate others on wildlife, the sanctuary may help to preserve animals that are threatened by the evaporation of the wetlands. You can donate to their animal care or provide for their scholarships via their website! Bayou Savage is located on the northern outskirts of New Orleans. It is the nation’s largest natural urban wildlife refuge. One of the last remaining marsh areas near Lakes Pontchartrain and Borgne, the refuge is an important habitat of diverse species including over 340 birds and the American alligator throughout the year. The refuge features a large wildlife habitat, bottomland hardwoods, freshwater, and brackish marshes, lagoons, canals and natural bayous which comprise over 24,000 acres. The waterways provide essential habitats for fish species and marine life like crabs and shrimp. Preservation efforts offer a comprehensive wildlife conservation plan. The plan–to be completely implemented by 2024–seeks to offer more recreational activities like fishing, environmental education including refuge restoration activities, coastal conservation issues, and water management regimes since the aftermath of Hurricane Katrina. An expansion of volunteer efforts is also a major focus. Archaeological and historical sites will also be maintained as a part of the New Orleans and Louisiana cultural preservation efforts. Check out their homepage to get involved. As a volunteer, your individual skills will be matched with volunteer interests and on-site training! These conservation efforts prove that attempts to preserve the wildlife, environments, and communities surrounding New Orleans bayous and coastlines are necessary. Not only will it directly improve the economic lives of locals, but it will also provide them with a richer cultural heritage and more sustainable lifestyles.